The Corporate Research Center of Schneider electric has different areas of competencies (from 5 to 10) that, to the extent possible, should mirror the 10 Technology Domains of Competency. Material and Processes domain is one the strategic technology. RHODIA OPERATIONS is a legal entity of the SOLVAY group. An international chemical and advanced materials company, SOLVAY assists its customers in innovating, developing and delivering high-value, sustainable products and solutions which consume less energy and reduce CO2 emissions, optimize the use of resources and improve the quality of life. Solvay serves diversified global end markets, including automotive and aerospace, consumer goods and healthcare, energy and environment, electricity and electronics, building and construction as well as industrial applications. SOLVAY is headquartered in Brussels with about 30,900 employees spread across 53 countries. It generated pro forma net sales of € 12.4 bn in 2015, with 90% made from activities where it ranks among the world’s top 3 players. With respect to FAME+, SOLVAY is particularly involved in Inorganic Materials Science, owing to its activity in industrial production of Rare Earths and derivatives, fluorinated Inorganic compounds, Sodium carbonate, and Silica. SOLVAY aims at developing new applications based on the relationship between composition, structure, and possibly morphological characteristics of the systems. Based in Louvain-la-Neuve (Belgium), AGC Glass Europe produces, processes and distributes flat glass for the construction (external glazing and interior decorative glass), the automotive (original & replacement glass) and the solar sectors. It is the European branch of AGC Glass, the world’s largest producer of flat glass. its 16,000 employees focused on the Customer. The Technovation Centre located in Jumet (Belgium) centralises research, engineering and IP activities under one roof. It employs 250 people among which 180 researchers (mostly Engineers and PhD’s), all driven by operational excellence and innovation. RAIZ – Instituto de Investigação da Floresta e Papel , is teh research center of the Navigator Company. In the pulp and paper industry, the Navigator Company is of great importance in the national economy, and was honored in June 2013 as the “Best Company in Europe” by the European Business Awards in the category “Business of the Year”. The Company’s production capacity and exports make it a driving force for Portugal’s economy, accounting for approximately 3% of all goods exported by the country, with turnover representing close to 1% of GDP. More than 50% of all power generated in Portugal from biomass, a renewable source of energy, is produced by The Navigator Company. The Company generates 5% of all electricity in Portugal. Bosch Termotecnologia S.A. in Aveiro is strongly committed to participate to the FAME+ Erasmus Mundus Joint Master Degree. With strong focus on innovation, the company is since 2002 the Bosch competence centre for domestic water heating, developing and manufacturing appliances, such as gas water heaters, electric storage water heaters and most recently heat pumps. The CEA is a French government-funded research organization and a key player in development and innovation in the areas of defense and security, low carbon energy, information and health technologies. It maintains a cross-disciplinary culture of engineers and researchers, building on the synergies between fundamental and technological research to promote innovation in industry. 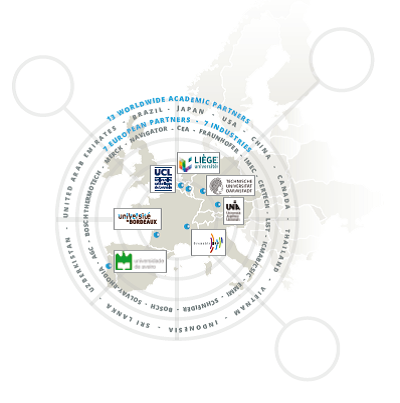 The CEA is actively involved in the European Research Area and its international presence is constantly growing. The Fraunhofer-Gesellschaft (www.fraunhofer.de) is the leading organisation for applied research in Europe, undertaking contract research with industry, the service sector and the government. The Fraunhofer-Gesellschaft maintains 67 research establishments (“FhG-Institutes”) at locations throughout Germany with a total staff of 24 000 and an annual turnover of roughly 2 billion €. The Fraunhofer ISC (www.isc.fraunhofer.de) located in Würzburg (Bavaria) is a materials research institute whose mission is to develop innovative non-metallic materials for tomorrow’s products. The main focus of this work lies on developing materials to meet the most urgent pressing challenges of our future in the realms of energy, environment, and human health; especially the more efficient use of energy and other resources are in focus. This approach involves continuous improvements to manufacturing processes and the development of new, multifunctional materials, e.g. by use of nanotechnology to create materials with enhanced properties and functions. These novel materials open up a whole new world of products for manufacturers and end users alike. The Luxembourg Institute of Science and Technology (LIST) is a mission-driven Research and Technology Organisation (RTO) that develops advanced technologies and delivers innovative products and services to industry and society. As a major engine of the diversification and growth of Luxembourg’s economy through innovation, LIST supports the deployment of a number of solutions to a wide range of sectors, including energy, IT, telecommunications, environment, agriculture, and advanced mtareials at national and European level. Thanks to its location in an exceptional collaborative environment, namely the Belval Innovation Campus, LIST accelerates innovation by maximizing synergies with different actors, including the university, the national funding agency and industrial clusters. The Institute of Materials Science of Barcelona ICMAB-CSIC is strongly committed to participate to the FAME+ Erasmus Mundus Joint Master Degree and to associate also its spin off company OXOLUTIA. OXOLUTIA SL is a technology-based company arising as spin-off of ICMAB-CSIC (www.oxolutia.com). Scale-up of nanostructured oxides by means of chemical metalorganic solutions in order to build useful devices for energy applications represents our commitment. Such endeavouring task is strongly knowledge-based and surely requires open collaborations with academia, which are a rich ground for students, scientists, engineers, consultants or technicians to empower themselves and bring high value to the innovation ecosystem. IMEC is an internationally renowned research institute that performs worldleading research in different fields of nanoelectronics. It combines a leadership in microchip technology with indepth expertise in software and ICT to lay the foundation of a more personalized healthcare, smarter cities, cleaner energy and more efficient mobility, logistics and manufacturing solutions. IMEC is committed in numerous research projects co-funded by the government, contributing strongly in Flemish and European R&D programs. Imec performs world-leading research in nanoelectronics, nanotechnology and digital technologies for groundbreaking innovation in application domains such as healthcare, smart cities and mobility, logistics and manufacturing, and energy. As a trusted partner for companies, start-ups and universities the research center bring together close to 3,500 brilliant minds from over 70 nationalities. In particular, IMEC offers a stimulating environment for Master and PhD research. The world-class facilities, including state-of-the-art fully equipped 300 mm and 200 mm process lines, and available expertise guarantee an unmatched support. In addition imec fosters talent of employees and residents via imec academy offering a wide variety of courses and seminars to improve the technical and soft skills.